Ten years on from its release The Dark Knight (2008) is still regarded as one of the greatest superhero films of all-time. Christopher Nolan’s Batman sequel was loved so much, it received a handful of Oscar nominations – even winning two – as well as receiving a Golden Globe and a BAFTA. 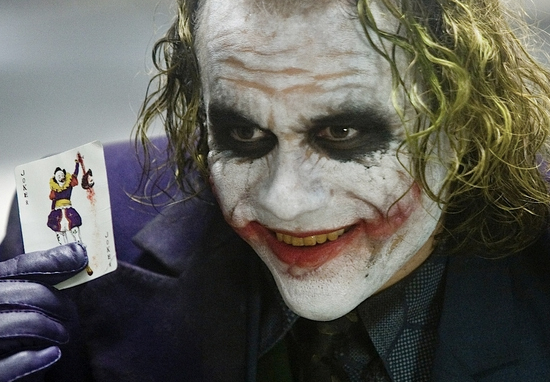 Yet the film’s main accolades were all for Heath Ledger – who played the iconic Joker – a character which has been voted Greatest Movie Villain Of All Time in numerous online polls. It also marks ten years since the death of Ledger, who received a posthumous Academy Award for Best Supporting Actor. Ledger had been so dedicated to the role, and following his death, his father Kim – in the documentary I Am Heath Ledger – showed viewers his son’s personal scrapbook, which was filled with notes, sketches, and inspiration in preparation for the part. He [Heath] pretty well locked himself up in a hotel room for weeks. He galvanised the upcoming character. That was typical of Heath. He would do that. He liked to dive into his characters, but this time he really took it up a notch. Heath chose me. He just was determined to do it. He just had a vision for something and the way he termed it to me at the time was, he really didn’t like to work too much. He liked to do a character and then stop working then let enough time go by. He wanted to be hungry for it and when he came to me, he was clearly in that state: very hungry. He was ready to do something like that and just own it – which is what he did. 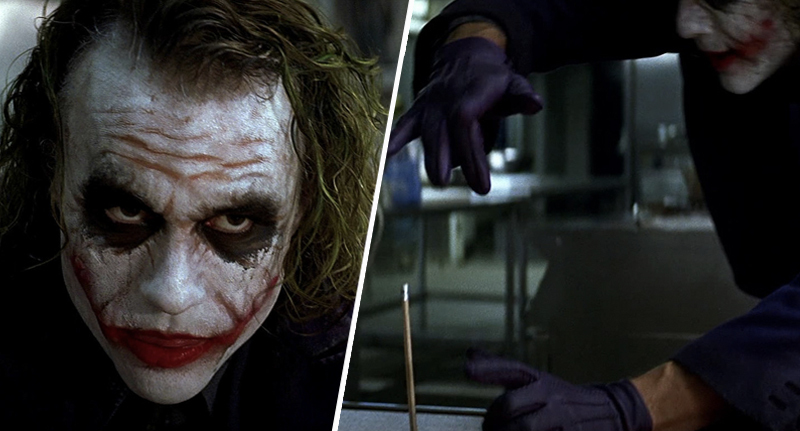 The Dark Knight was successful not only because of Ledger, it was full of immaculate set-pieces – one of which has been puzzling fans for a decade, in regards to how it happened. The scene in question consists of The Joker, a pencil, and a very unfortunate goon. There was no CGI or special effects involved – instead, it was all just a very clever trick. Am I the only still grimacing? Anyway, as seen in the clip above, the twisted, criminal mastermind is in the process of convincing Gotham’s underworld bosses to hire him to take care of ‘the Batman’, and while trying to portray his level of authority, takes a pencil out of his pocket and stands it upright on the table. He then puts a menacing question to the men before him: Do you want to see a magic trick? 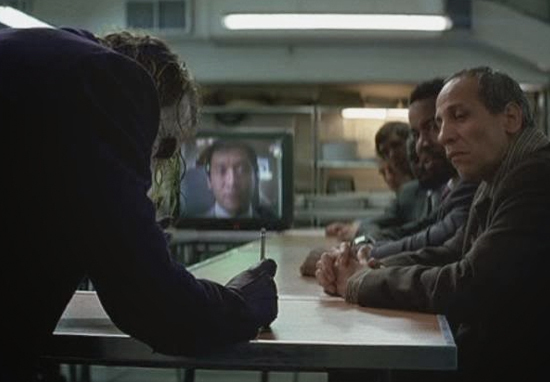 In one of the most gruesome scenes – for a superhero film at least – The Joker then slams an approaching man’s head towards the table and onto the pencil. The pencil indeed disappears from view, and seemingly going straight through the guy’s eye and into his brain, or up his nose and to the brain – either way he’s killed almost instantaneously. So how on Earth did they pull it off? I remember Christopher Nolan saying to me, ‘Look, we’re going to do a couple of shots where you need to be able to take that pencil away. We did a couple of half-speed rehearsals just to get the hand action of my right hand sweeping across, taking the pencil as my body was going down, and my head striking the blank surface. It was a little hairy, because the pencil’s stuck in the table. If, for some reason, I didn’t get my hand in time, we wouldn’t be having this conversation. Well, possibly through a Ouija board. Just for this once scene, Jarman apparently ended up getting knocked out three times. This was due to the number of times Ledger – who stayed in character pretty much at all times on set – slammed his head into the table. Nice! Jarman also revealed how this was one of the only occasions Ledger broke character – and it was to check if he was alright.